Edit Syndicate reserves the right to amend, change, modify, add or remove portions of these 'Terms and Conditions' as the organization deems fit and in the organization�s sole discretion at any time and without notice. You agree to be bound by such changes the moment they are posted on the website and you accessed the site. Please check these 'Terms and Conditions' periodically for any modifications. Unless otherwise indicated, this website and its contents are the property of Edit Syndicate. The copyright in the materials contained on this website belong to Edit Syndicate and/or the organization licensors. The trademarks appearing on this website are protected by international trademark laws. The copying, displaying, distributing, modifying, publishing, reproducing, storing, transmitting, posting, translating or creating of other derivative works from, or selling, renting or licensing of all or any part of the Content, products or services obtained from this website in any medium to anyone, except as otherwise expressly permitted under these Terms and Conditions, is prohibited. The use of this website to publish or distribute any advertising, promotional material or solicitation to other users of the website to use any goods or services; without the express permission of Edit Syndicate, is prohibited. For example (but without limitation), the use of the website to conduct any business, to solicit the performance of any activity that is prohibited by law, or to solicit other users to become subscribers of other information services without the express permission of Edit Syndicate is highly prohibited. Similarly, the use of the website to download and redistribute public information or shareware for personal gain or distribute multiple copies of public domain information is also highly prohibited. The use of this website to publish or distribute any information (including software or other content) which is illegal, which violates or infringes upon the rights of any other person, which is defamatory, abusive, hateful, profane, pornographic, threatening or vulgar, which contains errors, viruses or other harmful components, or which is otherwise actionable at law is highly prohibited. You further agree to indemnify Edit Syndicate against any claim, demand or loss incurred by Edit Syndicate as a result of a breach of the 'Terms and Conditions' or any right of any third party associated with Edit Syndicate. Edit Syndicate does not monitor any of the websites which may be linked to this website. As such you agree that the use of any website linked to this website is entirely at your own risk. Edit Syndicate reserves the right to suspend or terminate your access and use of this website at any time without notice; should there be need to take action in this direction. No representations or warranties are given as to the accuracy or completeness of the information provided on the website. This website may contain advertisements. Edit Syndicate may partner with third-party advertising companies to serve ads when you visit the website. 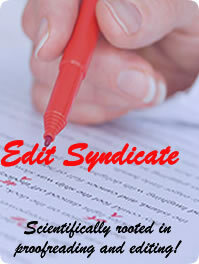 Edit Syndicate is not responsible for the content of any of such advertising material or any errors or inaccuracy in any advertising or sponsorship. This Terms and Conditions constitute an entire agreement between you and Edit Syndicate and supersede all prior communications and arrangements between you and Edit Syndicate. If any part of the 'Terms and Conditions' is deemed unenforceable then the remainder of the Terms shall continue to have full effect. In no event shall Edit Syndicate or any associated party be liable for any damages of any nature, arising out of or in connection with the use of this website, its content or any website with which it is linked. If you have any questions or comments regarding this Terms and Conditions, please contact us at: proofreadforme@editsyndicate.com, proofreadsyndicate@yahoo.com and proofreadsyndicate@gmail.com.